While there are reports of lower than anticipated sales of the iPhone, research seems to indicate that it isn't as much of an issue relating to US-based sales, according to Consumer Intelligence Research Partners (CIRP), in a report provided to AppleInsider. 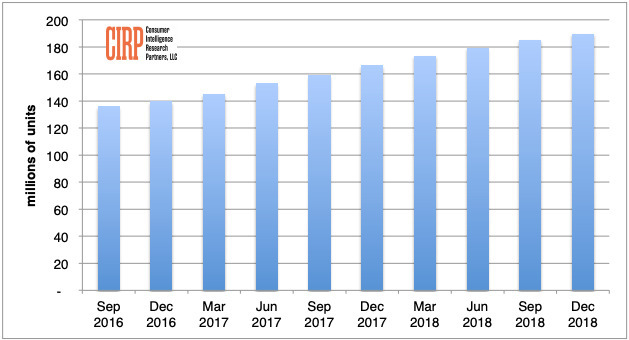 It is claimed the United States' install base of iPhones at the end of December is up just 4 million from the end of September 2018, when CIRP believes the base is 185 million iPhones. For the December quarter in 2017, CIRP believes the install base was 166 million units, which works out that the latest quarter saw a year-on-year increase of 13.9 percent. CIRP notes the increase is a reduction in growth compared to the 19 percent year-on-year increase saw last year. The 2 percent sequential quarterly growth is also lower than observed last year, which saw a 5 percent gain over the prior quarter. "With slowing iPhone sales, the installed base of iPhones in use in the US grow only slightly in the quarter," advised CIRP partner and co-founder Josh Lowitz. "As Apple itself indicated, iPhone revenues declined relative to last year, driven primarily by reduced demand in overseas markets. US sales remain relatively stable, which shows up in slight growth in the US installed base." In the January earnings announcement, Apple advised of a 15-percent year-on-year drop in iPhone revenue, which contributed to overall revenue of $84.3 billion missing initial forecasts of between $89 billion and $93 billion. CIRP notes the longer replacement cycles likely to have caused some of the reduction in the US install base growth, suggesting it is "primarily driven by first-time smartphone buyers and the limited number of platform switchers from Android to iOS." CIRP's report also takes a stab at attempting to answer the question of how many units Apple shipped in the quarter, a figure no longer disclosed by the company following a change in policy to not provide units figures in every results release. "We use our weighted average retail price for the US, called US-WARP, as a close approximation of ASP (average selling price)" states partner and cofounder Mike Levin. "Based on an estimated ASP of $839 and Apple's disclosed iPhone revenues of about $52 billion, we estimate Apple sold approximately 62 million iPhones, of all models and storage capacities, globally in the quarter." The analysts then translated this estimated figure for global shipments into its estimates for US unit sales. The main cause of Apple's reduced iPhone shipments is not the United States, but another major market. In his January warning to investors ahead of the results, Apple CEO Tim Cook cited lower revenue "primarily in Greater China" accounting for the revenue shortfall. To counter the slowing sales for the market, Apple started to slash the prices of its products in China in an attempt to boost sales, a tactic that seems to be having some success. The growth scale looks identical to the same time period in 2016, no? Dec 16-Mar 17 as well. What does the data say? If the iPhone has an install base of 185 million in the U.S., a nation with a population of something like 330 million, that's incredible. I'm not sure I buy that, but I wouldn't say it's not possible. That said, yeah, it isn't in the U.S. where Apple struggled (to the extent it's fair to say that it did) with iPhone sales in this past quarter. Even with a smaller iPhone ASP, Apple reported YoY revenue growth in the Americas of 5%. A lot of that came from other products and services, and iPhone revenue might have actually dropped (in the Americas) a little bit. But iPhone units (in the Americas) likely either grew a small amount or only declined a small amount. For that not to be the case, other products and services would have to have grown at a much higher rate in the Americas than in the rest of the world. WTH? Why would they use a US iPhone ASP number and a global iPhone revenue number to estimate global iPhone unit sales? We know that the iPhone ASP for the December quarter wasn't nearly $839 because we know that it declined from the year-ago quarter's iPhone ASP (using new accounting practices) of $790. We can't pin down iPhone unit sales for this past December quarter, but they had to have been 66 million or more. Well, I would buy that. On a recent flight from St. Louis to Phoenix (Southwest Airlines) I saw nothing on that plane but iPhones and iPads and I looked real hard because I’m, like, a fanboy extraordinaire. Southwest now allows free messaging but it only works with with iOS Messages and WhatsApp. The setup was a little quirky (finding the TOS agreement to accept) so I asked a flight attendant for help. Her response was, and I quote, “I don't know much but I know how an iPhone works” as she pulled out her own iPhone. Well, I would buy that. On a recent flight from St. Louis to Phoenix (Southwest Airlines) I saw nothing on that plane but iPhones and iPads and I looked real hard because I’m, like, a fanboy extraordinaire. It seems possible to me, but it isn't what I'd guess. It's just such an incredible number given the population of the United States. Androids dominate in the U.S. lower class and ghettos. Ever been to a DES? People only settle for knockoffs because it's what they can afford. Just look at country install base and average wages. As a professor who has my students use devices in class from time to time, I have to ask what they're using to anticipate any technical issues (eg. unfortunately one of the critical programs for my classes is only licensed for Windows on campus even though it's available for Mac). Mac/Windows is about 50/50 in most classes. iOS/Android is about 65/35. These are traditional age (18-22) students at a high quality but not elite private college (about $55k comprehensive fee).